No ads. 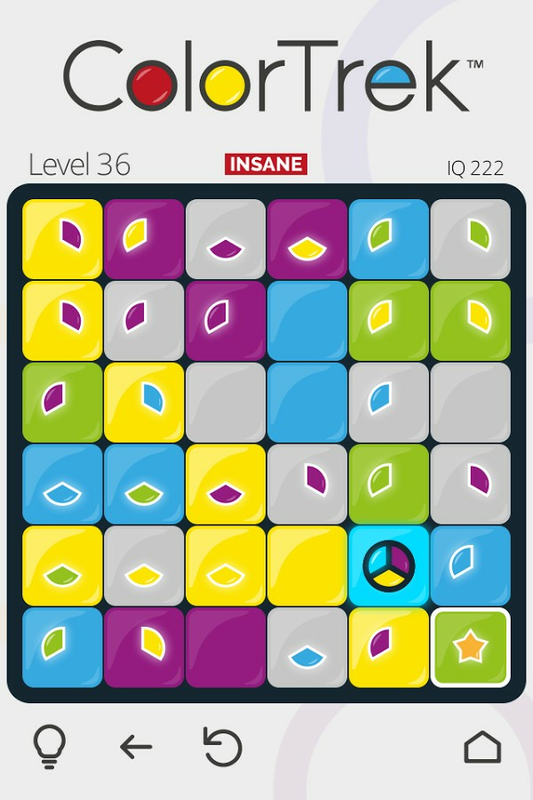 Over 900 free-to-play levels. No ads. No user account or social media login needed. Did we mention "No ads"? 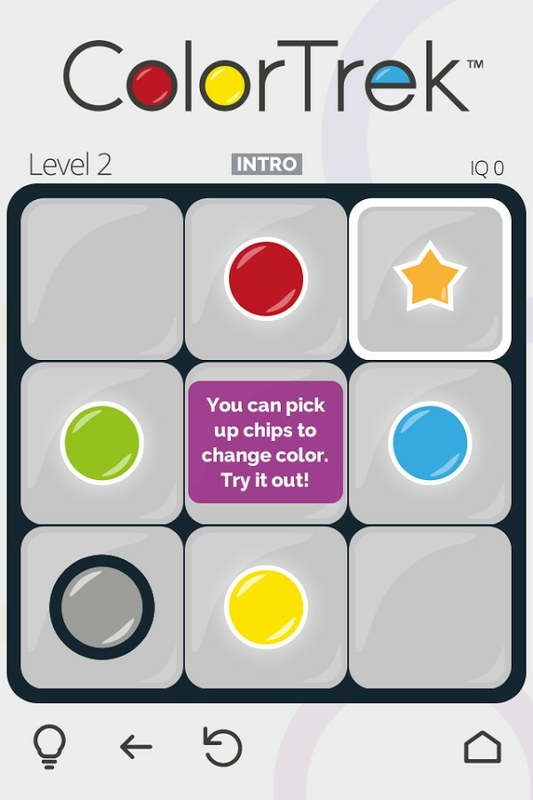 – Color﻿Trek allows you to fully focus on keeping your mind active and on exercising your logical reasoning, resourceful problem solving skills, situational awareness, and short-term memory. 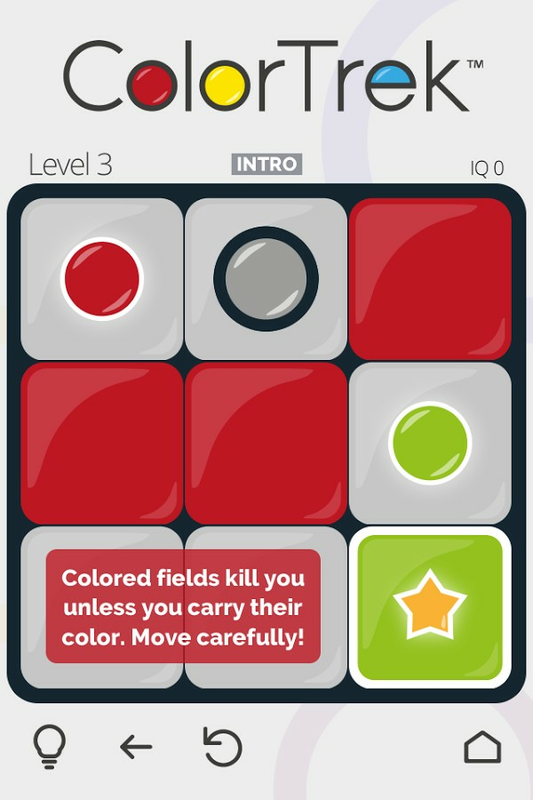 In addition to the usual categories of “easy”, “medium”, and “hard”, Color﻿Trek calculates a numerical difficulty rating for each level, ranging from IQ 0 (a relaxing feather-massage for your mind) to IQ 500 (an intense deep-tissue workout that will have you racking your brain with pen and paper in hand for up to an hour or more per level). In-app purchases provide a virtually unlimited supply of additional level packs at whichever difficulty you feel most comfortable. 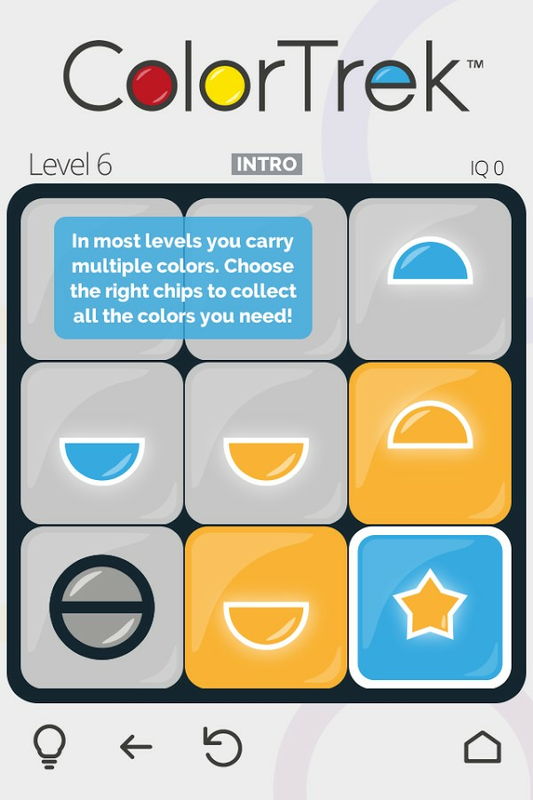 No matter where you are in a level, Color﻿Trek’s SmartHint™ system will either guide you to the next milestone you need to reach or, if you're stuck, get you back on track by telling you how many moves you need to undo. So, go ahead! Bring on your wildest moves! Try your craziest ideas! We'll always be there to fix you back up. 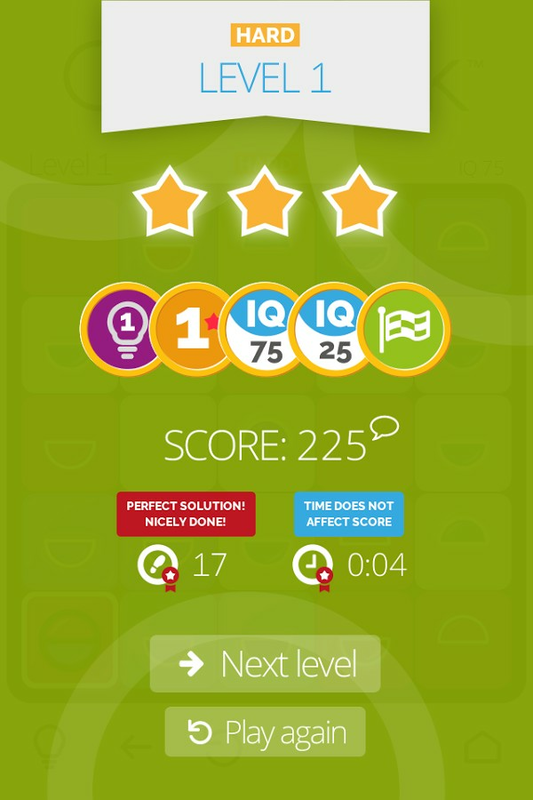 Earn up to three stars per level by finding the solution with the fewest possible moves. In addition to points for stars, you can unlock 25 fun achievements like the "Jailbird" for getting stuck, the "Perfectionist" for diligently working on a level pack until you finally earn all three stars in every level, or the "Wanderer" for aimlessly running around in circles. 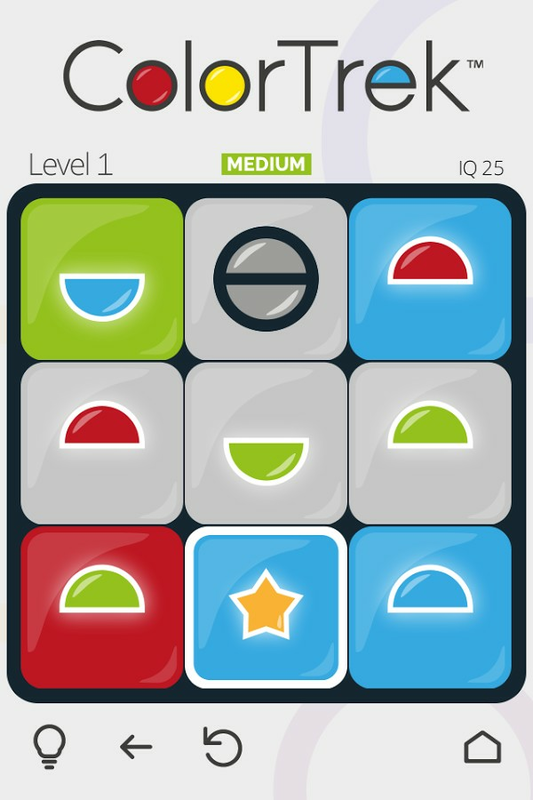 Challenge your friends to beat your score and unlock achievements first. Color﻿Trek is made from 100% recycled bits and bytes. It is entirely gluten free and contains no high-fructose corn-syrup, trans-fat, cholesterol, or genetically modified ingredients. It has 0 calories and is very low in sodium. No animals were harmed in the making of this game, except for a few (hundred) gummy-bears. We hereby promise that ColorTrek and our future games provide unique new gaming experiences based on our own original ideas and are not just copies or trivial modifications of already existing titles. We respect other developers' original works and consider plagiarism unethical. Please support us in this mission by contacting us at originals@vandenmars.com if you know of any preexisting games similar to ColorTrek, which we aren't yet aware of and should credit. Unfortunately, plagiarism has recently become quite excessive in the mobile gaming universe and we invite you to join us in not supporting developers that base their existence on stealing ideas. Tens or hundreds of copies of identical games make it very difficult for original ideas (not just ours) to be discovered, significantly reducing the incentive to design new and exciting gaming concepts.